I've written many posts since we started growing blueberries four years ago complaining about Mockingbirds that view our bushes as as nothing more than giant feeders. 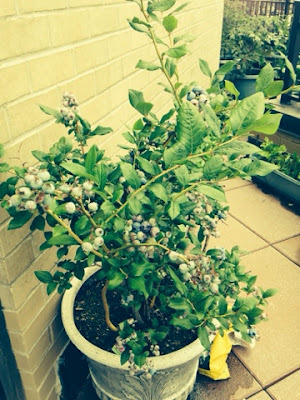 But this year, despite a bumper crop of blueray berries, the birds are strangely uninterested. We have seen them on nearby buildings and regularly hear them singing. We even sighted one on our terrace recently. But they have not been feeding on our juicy fruit. Sure, the berries are a little tart, but could that be it. The berries just aren't to their liking this season? Are these birds such connoisseurs that they are rejecting our fruit? Our neighbors Michele and Charles across the street grow blueberries as well. Are the birds stocking up there? I should be overjoyed. After all, when they come, they babble, chirping with verve outside our bedroom window at 5:30 a.m. And when they nosh, they take the berries just before they're perfectly ripe, which leaves us with little worth eating for ourselves. So, I'm thrilled that the birds have found blue-r pastures. I'm just trying to make sense of it all.